are sold I had developed my foodscape in northern California fairly well, but when I moved to Flagstaff, Arizona, it radically shifted. It was a new experience to find myself in a place where there were no farmers markets, no sun-dried tomatoes or fresh pasta shops, no foodies and urban singles, but instead supermarkets and busy families with children. I was forced to find new ways to access the kinds of foods I missed – driving far to buy from farmers, making connections with Mormon women who brought down peaches from Utah, meeting local gardeners whom I discovered at the country fair – and to learn how to make full use of the supermarket and its previously limited offerings. My challenge was to figure out how to come up with the same high-spirited flavors of my past but within the confines of less time and less variety. Despite the lack of abundance when it came to produce, herbs and other ingredients, I managed to find treasures I had overlooked previously and to cook food with the zest and flavor I knew and loved from my life in California. Flagstaff has changed since I lived there – it now has a farmers market and a Slow Food chapter – but learning to cook within limits was important to me. The Savory Way marked a shift away from restaurant cooking to the more straight-forward flavors and techniques of home cooking, something I’ve been committed to advancing ever since. 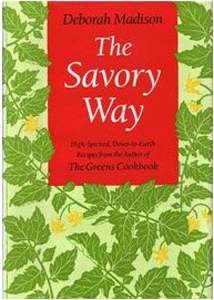 The Savory Way was named IACP’s best General Cookbook and was the Julia Child Cookbook of the Year. It is now out of print, but can be found on the Internet.